They're the largest group of foreign militants, and they're "fanatical." It's now been two weeks since the Pakistani army began its war against militants in South Waziristan at the south of the Federally Administered Tribal Area (FATA). And the most dangerous enemy of all is not the Taliban (indigenous Pashtun militants), but the Uzbeks from the al-Qaeda linked Islamic Movement of Uzbekistan (IMU). It's not known how many Uzbek militants are in South Waziristan, but estimates vary from 500 to 5000. In fact, it's possible that eliminating just the Uzbek force is the primary Army objective of the war. Army Chief Gen. Ashfaq Kiyani "was of the opinion that the dynamics of South Waziristan might change if we can take out the Uzbek fighters. They are the staunchest followers of Al Qaeda ideology, and they are viciously, rabidly anti-Army." From the point of view of Generational Dynamics, there are good reasons for the ferocity of the Uzbek fighters, and we're going to explore those reasons here. The Uzbeks are one of the many tribes that have populated Central Asia for centuries, and the wars they fought were mainly with one another until the Russians conquered the region in the late 1800s. Life didn't change much under the Tsars, but a violent anti-Russian movement began in World War I and the Bolshevik Revolution of 1917. Although the main fault lines were ethnic (Uzbeks vs Russians), it's worth noting that Uzbeks are mostly Sunni Muslim, while the Russians are Orthodox Christians. This was Uzbekistan's last generational Crisis war. 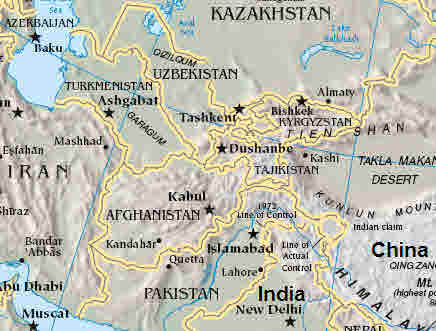 World War II thus occurred during a generational Awakening era for the Uzbeks. Thus the Uzbeks stayed out of the war, and in fact carried out a "humanitarian mission," according to one Turkish source: "During the World War II the Uzbek people are known to have accomplished a true feat by sheltering in their families the hundreds of thousands of refugees from the fascist occupied territories. Special care, warmth and generosity have seen the war-broken children. In all, during the war Uzbekistan had accepted over 200,000 children from Russia, Ukraine, Baltic States, Poland, and other countries...."
The IMU has been playing an important role in terrorist acts in Afghanistan and Pakistan. This is particularly true since the 2005 massacre at Andijon in the Fergana Valley. Hundreds of civilians were killed by government troops, to put down a violent takeover attempt by Islamist IMU militants. After the London subway bombings on July 7, 2005, I wrote an analysis of suicide bombers, based on data collected by the Chicago Project on Suicide Terrorism, published in a book by Robert A. Pape. Pape analyzed the nationality of al-Qaeda suicide attackers, and found that they come from 11 different countries, but that they overwhelmingly come from just two countries: Saudi Arabia and Morocco. 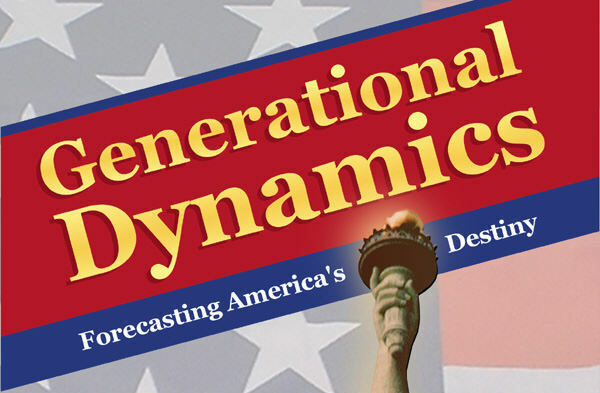 From the point of view of Generational Dynamics, this is exactly what's to be expected, since these two countries are the deepest into generational Crisis periods. Saudi Arabia's last crisis war was the Ibn Saud conquest, ending in 1925, and Morocco's was the Rif War, ending in 1927. I used this information to analyze the war in Iraq, particularly in the nationalities of suicide bombers in Iraq. The terrorist group al-Qaeda in Iraq was having difficulties getting Iraqis to become suicide bombers, so most suicide bombers had to be imported from Saudi Arabia. Once again, with Iraq in a generational Awakening era, and Saudi Arabia deep into a Crisis era, this made perfect sense. But it's been difficult and confusing to analyze the ethnic groups of the militants in Afghanistan and Pakistan. It's always been clear that they've received ideological guidance from bin Laden and al-Qaeda, and that made sense because al-Qaeda is a Saudi group. It's also been clear that the Taliban, made up of Islamist militant Pashtuns, have not been driving the terrorist acts. One fascinating sign of this is that Afghan Taliban suicide bombers almost never kill anyone but themselves. This is not surprising, since Afghanistan's last crisis war was the bloody ethnic civil war in the early 1990s, and Afghanistan is in a generational Recovery era. So it's always been a bit of a puzzle to understand where the genocidal fury among the Taliban comes from, even in Pakistan. This study of the role of the Uzbeks in Pakistan provides a solution to this puzzle. Uzbekistan is similar to Saudi Arabia in that its last crisis war ended in the 1920s, and so it is also deep into a generational Crisis era. Last week, on October 28, a massive terrorist attack occurred in Peshawar, the capital of the NorthWest Frontier Province (NWFP) of Pakistan, a largely Pashtun province. Over 90 innocent civilians, including many women and children, were killed by a timed car bomb explosion in a busy market area. There have been numerous terrorist attacks across the country on a weekly basis, but this one was different. Whereas previous attacks had targeted police or military installations, this one targeted a civilian marketplace. There was no claim of responsibility for this explosion. In fact, sources in al-Qaeda and the Taliban are denying responsibility and condemning the explosion. Of course the denials are not necessarily true, but assuming they are, who would have perpetrated this explosion? Government officials are thought to believe that the attacks on civilians are being carried out by Uzbeks -- in the Islamic Movement of Uzbekistan (IMU) and the Islamic Jihad Union (IJU), another Uzbek group, both allied to al-Qaeda. Once again, this makes perfect sense from the point of view of generational theory. The Uzbeks, deep into a generational Crisis era, would be in a generational mood that's much more accepting of genocidal acts, including the bombing of civilians. Obviously, more research is required to draw a definite conclusion, but the role of Uzbeks in Afghanistan and Pakistan appears to confirm many of the basic concepts in generational theory and Generational Dynamics, as they apply to Afghanistan and Pakistan.